This week on #meetascientist, get to know urban ecologist and environmental justice advocate Tiffany Carey. As a young scientist and community organizer, Tiffany has a fresh perspective on how scientists can work with communities to empower and educate. She currently does just that as a Science Outreach Coordinator at University of Michigan. We know you'll find her story and her insights to be inspiring! I really began to think like and identify as a scientist during my research project during my time as an undergraduate at University of Michigan. I started a citizen science project with Daniel Katz through the School of Natural Resources. I didn’t find science the traditional way — going on nature walks with my family or going out in the wilderness and camping. I’m an urban city kid from Detroit, so I didn’t do any of that. My parents knew nothing about nature or anything environmentally related. But when I got to college, I was interested in this research opportunity that the university offered called the Undergraduate Research Opportunity Program. I was interested in this idea that there were questions and issues in my community in Detroit that were related to environmental factors, and there was a possibility to answer those questions. The idea of research — the idea of taking a question and formulating it into something that actually has a solution — was how I was introduced to science. It was how I started thinking like a scientist. I came up with a project called “Pollen and Public Health” and it was relating ragweed, which is an allergen, to vacant lots in Detroit. I wanted to understand how pollen connected to ecological principles and concepts related to public health, and how I could use that knowledge to address community needs. I began to execute and implement the scientific method of answering a question: collecting data, analyzing data, and producing content that could essentially produce solutions. I also wanted to give opportunities to community members, specifically students, to contribute to my science by helping collect and analyze data. Through that experience, I realized that science isn’t just done in a lab or in the field. Science is a process of inquiry and exploration, and its products can be used in a way that contributes back to the community. That was an innovative, revolutionary moment for me and I thought: wow! I can contribute to the world through scientific inquiry with solutions. How do you carry your identity or role as a scientist with you in the work you do around science education, environmental justice, and community organizing? During my time in Baltimore I worked on the ground as a Growing Green Initiative Community Organizer. So I got to work with hundreds of individuals that wanted to change their green spaces (otherwise known as “vacant lots”) in their neighborhood. One of the ways that I was able to connect science to on-the-ground, grassroots change was really by facilitating greening strategies. This could mean anything from keeping the lawn mowed to maintain a clean green landscape, all the way to providing the resources and tools for people to start urban farms and stormwater management projects. Across that scale, I was really able to see science in action. I could frame the science through a lens of community integrity and stewardship, in a way that I couldn’t when I was sitting in a classroom. What kinds of plants you should grow and how to build a sustainable ecosystem is still science, but it has this extra layer when it’s actually carried through and translated into things that people care about as far as aesthetics and beautifying your neighborhood. I love the idea that science doesn’t necessarily have to be in a lab or some other constructed space. It can actually be translated to things that people care about as far as education, environmental justice, and made into an organizing tool. Science can be a way of empowerment for these communities that want to do meaningful work and have their own needs. We’re not imposing science questions on them, but actually asking and listening to the community to meet their needs. Focusing and narrowing down the connection between science and people’s real lives and needs is really what I’m passionate about. That’s how I do my work at the university now, how I was able to do it as a community organizer and coordinator in Baltimore, and how I was able to engage citizen scientists in community-based research. What advice do you have for scientists getting started in the work of outreach, social justice, and organizing? I did a workshop at the Ecological Society of America (ESA) meeting in Portland about inclusive ecology and how we can use relational approaches to approach topics like racial issues and discrimination and privilege. One of the things I really honed in on is language. I’ll give an example from Baltimore. I used the phrase “vacant lot” quite a lot because it’s one of the most commonly used terms all the way from government to grassroots organizations. But “vacant lot” is a disempowering term that only brings a negative light to space that has been historically abandoned because of systemic forces out of the community’s control. So we prefer using “green spaces” because, from an ecological perspective, these spaces offer a lot of opportunities for identifying urban plant and animal species. It also gives a different texture to neighborhoods that people haven’t historically seen as beautiful. So something I want to put into scientists’ ears is be careful of language. Be careful of how you frame stories and narratives. Be sure you have everyone at the table before you relay what you saw or what you experienced in a neighborhood or a space. I also speak a lot about equity and access to resources — from grants to knowledge of organizational structures. That has a huge implication on social justice and community organizing. Information must be equitable and accessible for people to know that they are empowered and they have the right to certain systems and practices. A lot of my outreach work is focused on transparency and rooted in the idea that we cannot move forward unless the system is transparent to community stakeholders. That transparency has to come from every angle — nonprofits, government, academia, institutions, private developers. Everyone has to be transparent about their plan and how they’re going about making forward advances so we can all be on board. 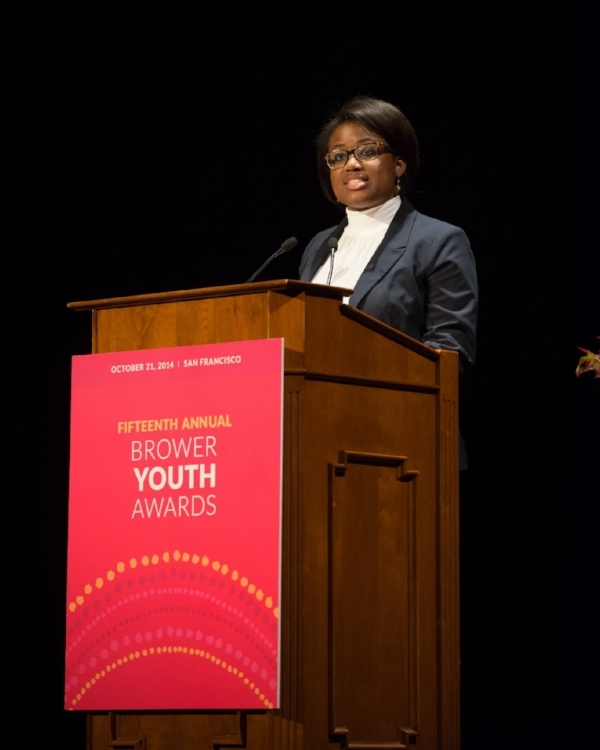 Tiffany accepting the 2014 Brower Youth Award. You can watch her acceptance speech along with a profile on her work. How did you get involved with 500 Women Scientists? What experiences would you like to bring to the group and what would you like to get out of it? I was able to meet many 500 Women Scientists members at the ESA meeting in Portland. I was really encouraged and inspired by a lot of the conversation that happened there. I was happy to see that there were representative from 500 Women Scientists walking around and engaging in conversations at the meeting. I really want to bring my experiences and insights into how to provide transparency in the scientific culture. We have no way to mediate or resolve the issues that exist in science if we are not being transparent with how decisions are made and which voices are being heard. I also want to support scientists who are interested in social justice and environmental justice education. In my seven years in the space, I’ve been taken aback not only by the number of people who haven’t been intentional in their work, but also the number of people who are interested in getting involved and are not offered the tools to make that happen. As far as what I want to get out of my involvement with 500 Women Scientists, I want to learn how to be the best woman scientist in the space that I’m in. I know that I have a nontraditional path; I didn’t go from undergraduate to Ph.D. to postdoc. But I can offer a different kind of expertise in applied science that I don’t see very often — through education, through environmental justice, through community based research. As a young scientist, how do you avoid burnout, especially with all the work that you do? What do you like to do to unwind? I’ve been obsessed with meal prep. I recently had a nutritionist set some habits around what a good meal prep is. As much as it might be a stressor to most, it’s actually been very soothing and therapeutic to know that I actually am making something that is healthy and delicious and satisfying. It’s also fall time in Michigan, which means I get to enjoy the fall apple cider mills and apple pies and scenic train rides. I’m also a huge avid dancer, so I love to salsa, tango, rumba. My mom is from Haiti, so I was in the African dancing club a few years ago and I’m thinking about picking that up again. I’ve been finding ways that are not only fun activities, but they’re also really positive, which has helped me avoid burnout. The saving grace for me is consistent habits that are positive and are helping me with my mind, body, and soul. Tiffany Carey received her B.A degrees in Political Science and Environmental Studies from the University of Michigan. In her undergraduate career, Tiffany worked in the School of Natural Resources at the University of Michigan, where she created a 4 year citizen science research project to investigate the factors associate with allergenic pollen, ragweed (Ambrosia artemisiifolia), production in Detroit, Michigan in respects to vacant lot regimes. Given her experiences with research and community organizing in both Baltimore and Detroit, she believes that combining ecology, design and community organizing is not only a means for integration and interdisciplinary conversations, but also the avenue for long term management solutions. As a new member of the Applied Wildlife Ecology lab in 2016, Tiffany is assisting the lab with designing and creating public engagement materials, organizing K-12 opportunities and managing multi-stakeholder partnerships to broaden participation and bring awareness to wildlife in Michigan and beyond. Tiffany aims to obtain a dual Masters degree in Natural Resource Management and Urban Planning (M.S. and M.U.P) to continue gaining the skills needed to design and consult on socio-ecological projects, while building sustainable spaces with community based approaches.